Reformists won big in the recent elections, but Trump favors confrontation, which helps Iranian hard-liners. The US government has drawn a big sigh of relief. 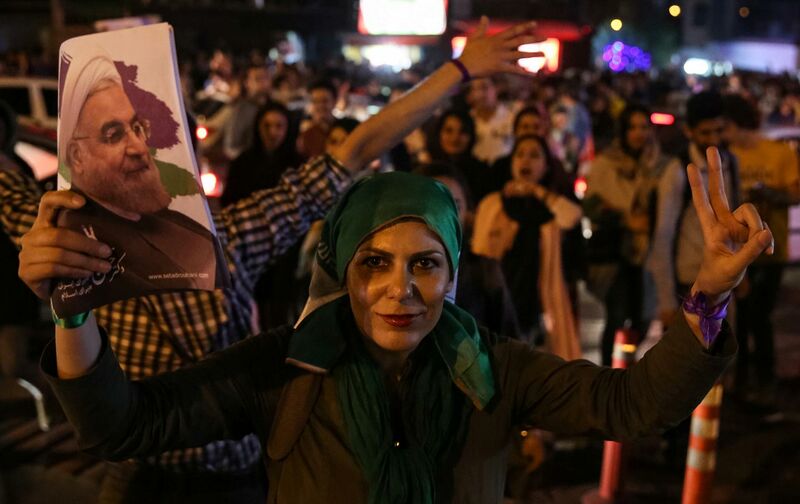 After decades of being on the retreat, Iran’s pro-democracy forces have regained momentum and are once again moving their country in a more liberal direction. The historic 2015 nuclear deal, which benefited Iran’s moderates, appears to be holding ground. In turn, Washington has decided to double down on diplomacy in order to further move Tehran toward reconciliation and reintegrate it into the global community. Engagement has paid off, and the United States is recommitting itself to the path that’s proven to be the only effective policy toward Iran. Just kidding. The above would hold true in a parallel universe, one in which US policy toward Iran was characterized by rationality. In the universe we live in, however, Washington’s approach is motivated by an irrational fear of losing Iran as an enemy. Instead of welcoming the country’s courageous democratic steps—which Washington for decades has claimed it desires—President Trump clenched his fist and doubled down on enmity by calling for regime change and Iran’s isolation. Only Saudi Arabia and hard-line elements of Benjamin Netanyahu’s cabinet in Israel welcomed this belligerent move—the same two countries that also opposed the nuclear deal. But it isn’t just the path to US-Iran reconciliation that Trump is blocking by outsourcing Middle East policy to Saudi Arabia and Israel. He also risks jeopardizing Iran’s path toward reform and democratization. And it wouldn’t be the first time the United States stood in the way of the Iranian people’s yearning for democracy. In the 1950s, Britain and the US overthrew Iran’s embryonic democracy in order to seize the country’s oil wealth. In the early 1950s, Iran was an embryonic democracy. The 1906 Constitutional Revolution had replaced the millennia-old absolute monarchy with a constitutional monarchy—the first of its kind in the Middle East (Saudi Arabia still doesn’t have a constitution). Iran had a Parliament that was directly elected by the people, which in turn elected the country’s prime minister. The Iranians had fought hard for these pivotal steps toward full democracy. However, Great Britain, then still a dominant Middle Eastern power, stood in the way. Ever so hungry for Iran’s vast oil reserves, London interfered incessantly in the country’s internal affairs to keep it weak and incapable of fending off British theft of Iran’s riches. Led by Mohammad Mossadeq, a nationalist member of Parliament who was elected prime minister in April 1951, the Iranians began demanding that the country’s oil industry be nationalized so that the wealth from it would benefit their own country rather than end up in British coffers. But Britain was in no mood to share Iran’s oil wealth with the Iranians. And the Shah—Mohammad Reza Pahlavi—was wary of the increased power and popularity Mossadeq was gaining from whipping up nationalist sentiments. Even an illegal naval blockade imposed by London, which almost entirely cut off Iran’s oil sales, failed to diminish Mossadeq’s popularity. As Stephen Kinzer describes in his indispensable book All the Shah’s Men, London concluded that it needed to get rid of Mossadeq and expand the power of the Shah. However, vastly weakened by World War II, Britain needed America’s blessing and assistance; earlier attempts to draw Washington into the conflict in support of Britain had failed. But as political deadlock gripped Iran, Winston Churchill’s government began using a new argument, to which Washington was exceptionally vulnerable: If Mossadeq wasn’t removed, he would eventually move Iran into the Soviet camp. This would be a significant blow to the United States at the height of the Cold War. Although there was no evidence that Mossadeq had communist sympathies, the British argued that he could develop such inclinations and that Washington couldn’t afford this risk. The argument worked. The Eisenhower administration ordered the CIA to team up with the British MI6 in what became known as Operation Ajax. With a $1 million budget, the Near East and Africa division of the CIA, led by Kermit Roosevelt Jr., grandson of former US President Theodore Roosevelt, went to work. Propaganda against Mossadeq was disseminated, and Iranian CIA operatives pretending to be pro-Mossadeq threatened Iranian clerics in Mossadeq’s name, in order to turn the powerful religious community against the prime minister. The Shah brutally clamped down on dissent and democratic demands—with the approval and assistance of Washington. As CIA-engineered protests swept Tehran (the CIA paid protesters on both sides in order to maximize the chaos), the Shah’s military stormed the capital on cue and took over the city. Mossadeq was arrested and many of his associates were imprisoned. The Shah quickly moved to negotiate a deal with foreign oil companies that gave Washington and London the lion’s share of Iran’s oil, while strengthening his grip on power, reducing the role of Parliament, and brutally clamping down on dissent and democratic demands—all with the approval and assistance of the United States. In recent years, the struggle for democracy in Iran has regained momentum. But it is not Iran’s political system that is impressive—indeed, it is fundamentally flawed and undemocratic. Rather, it is the maturity of Iranian society that holds the promise for a more democratic future. While most countries in the region don’t even hold elections, Iranians have now—in three presidential elections in a row—voted for the most moderate candidate on the ballot (including the controversial 2009 elections, when the Green Movement’s victory was stolen from the people). Iran is one of few countries in the world where an anti-populist message wins you a landslide election victory. Women made significant gains throughout the country, especially in city-council elections. Women made significant gains elsewhere as well. In the Tehran city-council elections, women grabbed six out of the 21 seats—the highest number yet. In the Sistan and Baluchistan province, women won 415 city-council seats—an increase from 185. There were even council elections in which no men were on the ballot at all. What we are witnessing is the promise of democracy manifesting itself. In this struggle, now more than a century old, the driving force has consistently been Iran’s own moderate society. This society has incessantly pushed for democratic change, and whenever external threats and internal strife have been absent, Iranian society has moved the country in that direction. None of this seems to have registered with Trump. Standing in a room in Riyadh, where the overwhelming majority of leaders standing with him were unelected autocrats, Trump not only called for Iran’s isolation, he fully joined the Saudi side in the region’s increasingly dangerous Saudi-Iranian rivalry. Just as the Iranian people sent an unmistakable invitation for further engagement and dialogue, Trump took the United States back to the Bush-era policy of confrontation. It’s a policy with only one clear winner: Iran’s hard-line elements, who oppose both Iranian society’s desire for more democracy and closer relations with the United States. The hard-liners’ attempts to reimpose a repressive security atmosphere inside Iran, as it did in the Ahmadinejad era—with a clampdown on civil society and the NGO sector—has been decisively rejected by the Iranian electorate. But now Trump is giving the hard-liners a second lifeline by opting for confrontation. Whether intended or not, we may very well see a repeat of 1953, with the United States once again strangling the Iranian democratic baby just as it is about to take its first steps out of the cradle.